We promised a new column for December, and here it is! In Spotlight On, we train our sights on cosplayers in the local scene, and explore why they do the awesome things they do! In this very first installment, we have a chat with ConJurer CJ, who burst into the limelight in a big way with his portrayal of female characters Shannon (from Umineko no Naku Koro Ni) and Mami Tomoe (from Puella Magi Madoka Magica). How did this 23-year-old get into the cosplay (and crossplay) habit, and what are his plans for the future? We find out. Crimson: Tell us a little more about your history with cosplay. ConJurer CJ: I’ve been cosplaying for five years. When I started, I happened to have clothes that looked like Light (from Death Note), and I thought I’d just try it out because it was convenient. That’s when I made my first prop too, and it was the Death Note. Later, I did L (also from Death Note) in 2007. Again, I had clothes that looked similar to L’s costume, so I wore them. I also did Lelouch (from Code Geass) in 2008, and that was with a group of friends. I stopped for three years due to National Service, school, and work, and started again recently. Crimson: And that was as Shannon right? What prompted you to crossplay after the string of male characters? ConJurer CJ: I never really thought of male and female cosplay as being different. What matters is choosing a character that you can pull off. Gender doesn’t matter. How Shannon came about was that a close friend of mine suggested doing a gender-reversed version of a pair of siblings. We decided that I’d portray the elder sister Shannon, and that she’d be the younger brother Kanon from the Umineko series. Unfortunately, her studies got in the way, and she couldn’t complete her costume in time. That’s why it was only Shannon at Cosfest and STGCC. ConJurer CJ: Mami was decided right before Shannon, actually. I had just finished watching the series, and I thought I’d cosplay one of the characters. 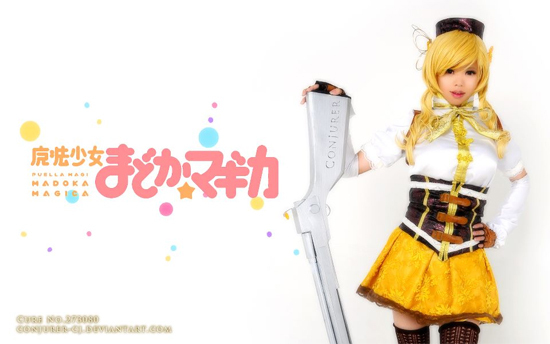 Homura was my first choice, but I thought that since I was tall, and Mami was the tallest, I should do Mami instead. Homura is still my favorite character though. Crimson: How do you feel about being a successful ‘trap’? It’s like a badge of honor for crossplayers, isn’t it? ConJurer CJ: I’m ambivalent about this. It’s just a title. For those who know me better, they will know that there’s more to me than just being a trap. You can’t deny that it’s a good jump-start for popularity though. ConJurer CJ: I wanted to challenge myself, to do something that required planning, design and courage. A lot of people advised me against crossplay. They said “don’t try it unless you want to attract negative attention”. But for me, I saw that as a challenge. I’m glad I’ve managed to pull it off and be accepted. Crimson: You were selected as a finalist for the Anime Festival Asia Singles Cosplay Showcase, featured on Nico Nico Douga, and even made it into an episode of Danny Choo’s Culture Japan. Would you consider that a triumph? ConJurer CJ: Actually, I’m just a very plain guy who started out knowing next to nothing about making stuff. I just hope to inspire people. I want to show people that anything is possible if you’re disciplined, and if you put in the right amount of effort, no matter how ordinary you think you are. Crimson: What do you think about the local cosplay scene? ConJurer CJ: I think many cosplayers in Singapore take cosplay too seriously and too soon, while non-cosplayers make light of it. But that’s reflective of our culture. We’re always in a rush to jump on the bandwagon. It’s a hobby, and we shouldn’t be too stressed over a hobby till we don’t enjoy it. There’s no need for rivalry; it’s hardly even supposed to be competitive. It shouldn’t be overly commercialized, to the point that only a few benefit at the expense of others either. Crimson: Any final advice for our cosplay friends? ConJurer CJ: Just stay focused, be objective. Let cosplay enrich your life, and know when to steer yourself back onto the right track the minute you feel yourself starting to stray. As for crafting props and costumes, it’s not as complicated as you think. Don’t doubt yourself or your methods, but don’t think of money as a cure-all for your problems. It’s important to reach a balance between time, effort, money spent and the desired end result. Also, learn from mistakes and be open minded. That’s what’s most important. ConJurer CJ also let on that he’s competing in next years World Cosplay Summit (WCS) qualifiers (in February 2012), so do pop down to Cosfest X.2 to show him your support. Spotlight On is a new column featuring cosplayers in the local scene. If you’re a cosplayer and you’re keen to be interviewed, or if you know a cosplayer who might just fit the bill, we’d love to hear from you! Drop us a note at INFO [AT] NEOTOKYOPROJECT.COM with the header Spotlight On, or leave us a message on our Facebook page and we’ll get back to you as soon as we can!